Congress leader Kamal Nath was on Monday sworn-in as 18th chief minister of Madhya Pradesh at a ceremony attended by a galaxy of leaders. Governor Anandiben Patel administered the oath of office to 72-year-old Nath, who led the Congress to victory in the recently-concluded state Assembly polls. No other minister took oath along with him. The Congress on Thursday had named Nath, the nine-time Lok Sabha member from Chhindwara, to head the state Congress Legislature Party, after hours of hectic parleys held by party chief Rahul Gandhi with senior party leaders. On his arrival at the venue, Gandhi was greeted with loud cheers by the crowd. 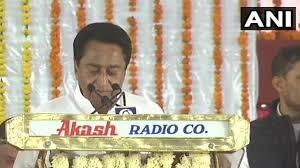 He was flanked by Nath and state Congress’ campaign committee chairman Jyotiraditya Scindia.